African food is finally getting the recognition it deserves in the UK, with dishes from countries like Ethiopia, Eritrea and Tanzania entering the mainstream. Get to know more about the spices, ingredients and methods that make East African cooking this year’s most exciting trend. The UK has to be one of the best countries in the world for foodies wanting to taste their way around different cuisines. Few other countries can boast streets lined with restaurants each serving authentic British, Italian, French, Indian, Chinese, Thai, American and Spanish dishes. But there’s one continent that’s never really enjoyed the same exposure in the UK as others – Africa. That is, until now. We’re finally starting to become familiar with the incredible dishes and flavours that have been loved in Africa for years, and it’s East African food in particular that seems to be exciting us the most. You might struggle to name a single dish originating from countries like Kenya, Eritrea and Tanzania, but we think that’s about to change. 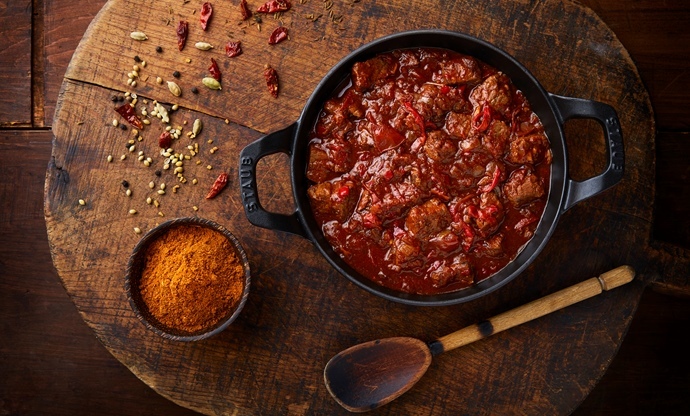 And it's not just us, either – Schwartz, responsible for the world's best quality spices, have tipped the cuisine to be the next big thing in their 2018 Flavour Forecast report, which identifies the trends that are set to have the biggest impact on the global food scene every year. And as their past reports accurately predicted the rise of things like Middle Eastern sauces, Peruvian food and mezcal, it's safe to say they know what's going to be the next big thing. Large parts of East Africa have been influenced by many different cultures, resulting in a melting pot of ingredients, flavours and cooking techniques. Dishes are almost always cooked with a vast array of spices, which must be top quality to ensure a strong, pure flavour. Using black pepper ground from whole peppercorns or cinnamon that has been matured for up to twenty years, for example, is key to ensuring East African dishes have the required intensity. As a very general overview, East African cooking tends to focus on grains, slow-cooked stews, curries and dairy, which are (especially in the Horn of Africa) flavoured with a variety of spices and spice mixes thanks to the Arabian influence from countries like Yemen, Oman and Egypt to the north as well as the Indian connection to the east. But to get a real feel for East African food, you need to look at the various dishes that are enjoyed in the region’s different countries. Read on for a crash course in the East African dishes and ingredients that are set to become more and more popular around the world. 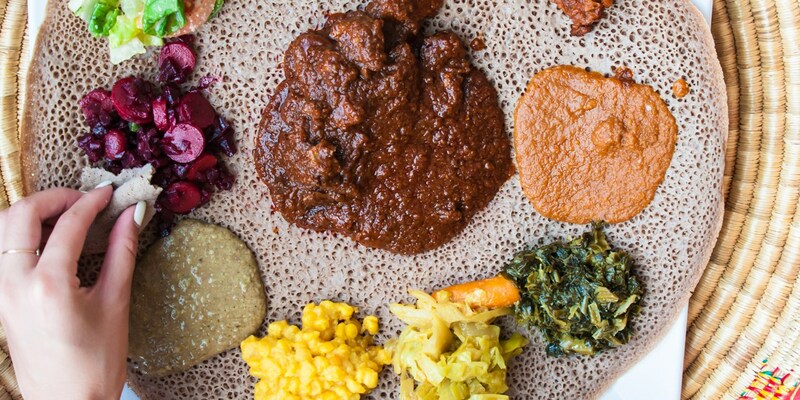 Arguably the most well-known East African cuisine, Ethiopian restaurants have popped up across the UK in recent years. The iconic dish of the country is injera, a fermented flatbread made with teff flour which is spongy, slightly sour and used as a sort of scoop to pick up other foods in lieu of cutlery (much like chapattis and other flatbreads in India). The most popular thing to serve with injera is wat, a thick stew of meat, vegetables or lentils. The sauce is flavoured with Ethiopia’s favourite spice mix berbere – an aromatic mix of chilli, ginger, fenugreek and peppercorns, plus lesser-known spices ajwain, korarima (also known as Ethiopian cardamom) and sometimes locally grown herbs. The result is a fiery, highly flavourful mix of spices that adds an instant Ethiopian taste to dishes, although recipes for berbere tend to differ from cook to cook. Another Ethiopian spice mix used in dishes such as ful medames – a bowl of crushed fava beans that’s enjoyed in many African and Arab countries – is mitmita. Comprised of dried crushed chillies, cardamom, cloves and salt, it is generally sprinkled over the top of food as a type of seasoning. Keep an eye out for niter kibbeh, too, which is clarified butter infused with spices such as cinnamon, black cardamom and fenugreek that's stirred into dishes for extra flavour. There's also kitfo, a raw beef dish that's particularly popular in the country, and awaze, a spice paste made from berbere that's used to marinate and flavour meat. At first look, Eritrean cuisine can look very similar to Ethiopian, as many meals revolve around injera and spicy stews (known as tsebhi or zigni instead of wat). But there are some key differences. Being on the coast means there’s fish and seafood available (although most Eritreans prefer meat and vegetables), and tomatoes are more prominent due to the Italian influence on the country (Eritrea was colonised by Italy in 1890 until 1947). It’s not uncommon to find pasta cooked with spiced sauces, and panettone is sometimes served with coffee. Berbere is the most popular spice mix used to flavour dishes in Eritrea, particularly beef zigini. Niter kibbeh is used as well, albeit in smaller amounts as the food tends to be lighter than in neighbouring Ethiopia. Dishes such as shiro – a porridge made from puréed chickpeas and spices – and alicha birsen – a lentil curry – are very traditional vegetarian dishes. Further south, Tanzania has a completely different cuisine to Ethiopia and Eritrea. Heavily influenced by Indian cooking thanks to the migration of Indians into Tanzania and making the most of the abundance of fish and seafood along its eastern coast, coconut milk is also used to create sauces for curries, which are often heavily spiced and full of fiery heat. Further inland, barbecued meat (known as nyama choma) is popular, and the national dish of ugali is a dough made from maize, cassava, sorghum or millet, served with a dry spiced curry of meat, fish or vegetables. Different varieties of bananas are also grown all over Tanzania, and are often grilled or stewed in savoury dishes. The island of Zanzibar is particularly well-known for mchuzi wa samaki, a fish and coconut curry spiced with cumin, coriander and garam masala. Rice is more popular than beans and grains along the coast of Tanzania and on Zanzibar, but there’s a clear southern Indian influence throughout, with chapattis or pilau often cooked for celebrations. With influences from Turkey, Italy, India and other East African countries, Somalia’s most popular dishes come from all over the world. Pasta (baasto) or rice (bariis) often forms the carbohydrate of a meal, which is then topped with a meaty sauce spiced with cumin, cardamom and cloves. There are also lots of Indian flatbreads such as chapattis, fermented flatbreads like injera and pancakes. Turkish-style kebabs are popular in the south of the country, and meat is the protein of choice for the majority of Somalians (except during religious fasting periods). Bananas are often served on the side of savoury dishes. 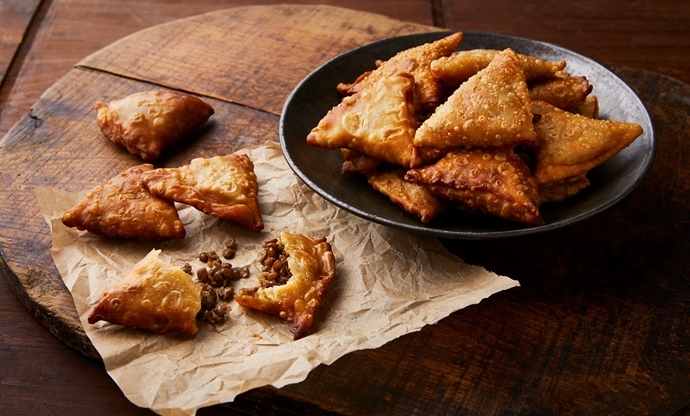 One popular snack that’s found not just in Somalia but throughout East Africa is sambusa, which looks exactly like the Indian samosa but is filled with minced meat (sometimes fish), lots of chilli and spices. Halva is also served as a sweet treat during religious or celebratory occasions, as are many other sweet cakes. It’s difficult to sum up the cuisine of Kenya as dishes tend to vary considerably depending on where you are in the country and who’s cooking them. 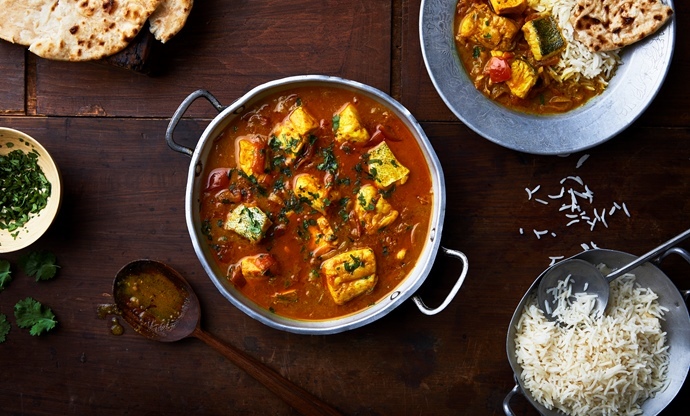 You’ll find fish on the coast, grains in the remote areas and internationally influenced dishes in the cities (such as Indian flatbreads and curries). 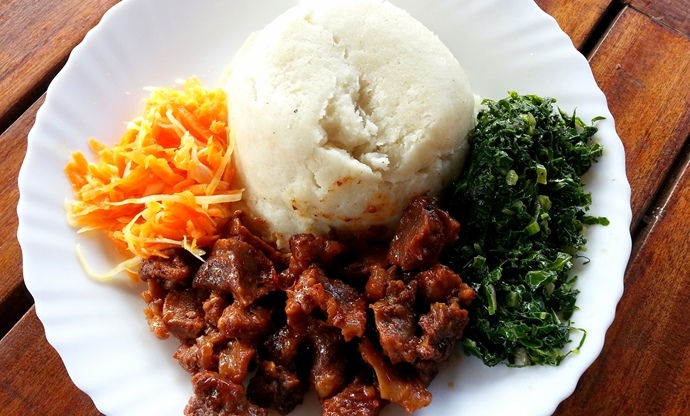 Starchy, grain-based foods are the most commonly eaten, and ugali is an important staple like in neighbouring Tanzania. 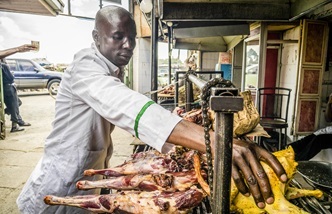 Barbecued meat (nyama choma) is popular but generally not eaten daily – instead, dishes of beans and corn or sukuma wiki (sautéed leafy greens, often kale) are relied upon. Common spices used to flavour dishes are cumin, turmeric, coconut, coriander and tamarind, especially in Swahili cooking. For authentic street food, you can’t get more Kenyan than mutura, a boiled sausage of minced goat and goat blood which is then barbecued. Dijbouti is a small country in the Horn of Africa surrounded by Eritrea, Ethiopia and Somalia, but has its own food culture, in part due to being a French colony and sharing many characteristics with Yemen, which is just across the Red Sea. 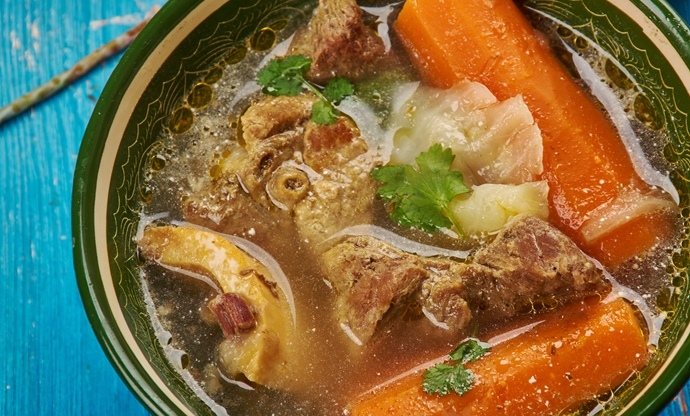 Baguettes are still eaten in the country, and French mustard is a popular condiment, but arguably the most popular dish is fah-fah, a soupy stew made from goat, mutton or camel meat and flavoured with lots of chillies. Injera-like flatbreads can be found throughout the country, and skudahkharis is a biryani-like combination of rice and lamb heavily spiced with niter kibbeh. Saffron, cinnamon, cardamom and nutmeg are popular spices, and fish cooked Yemeni-style (split in half and cooked in the oven) are considered a delicacy. Further towards the centre of Africa is Uganda, and the country’s cuisine takes on a different style. Peanuts are an important part of many Ugandan stews, which are often served alongside ugali (known as posho locally). 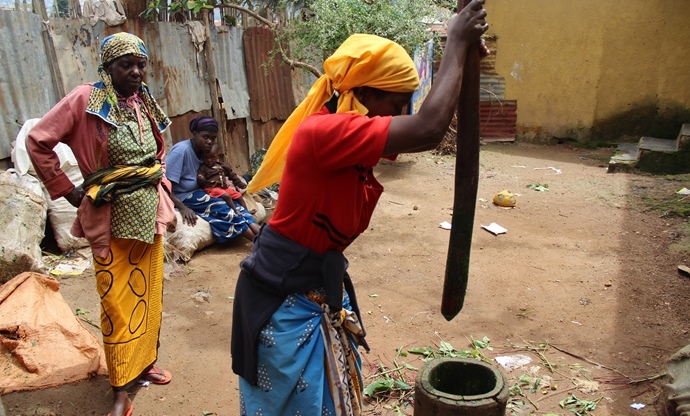 Meat of all kinds is popular, although in more rural areas it is less common, and dried fish is usually rehydrated in stews. 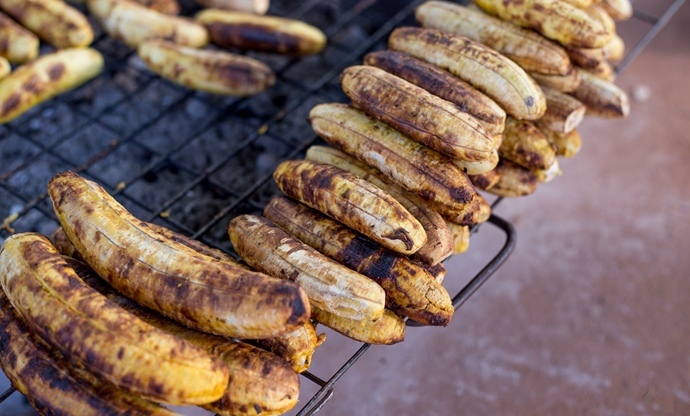 Bananas and plantains are a staple in Uganda, and a small variety known as matoke is commonly cooked when still unripe and green, being roasted, steamed, boiled or mashed. It’s served with a peanut-based sauce called binyebwa (or gnut sauce), or turned into a curry and served with chapattis. The traditional African staples of plantains, sweet potatoes, cassava and beans make up the majority of Rwandan dishes, with ugali and mashed matoke bananas eaten most days. Meat is a once-in-a-while treat in the more remote parts of the country, but in the larger towns and cities its often sold on skewers known as brochettes. In the past Rwanda was a Belgian colony, which had a lasting effect on the local cuisine – you’ll find potatoes, either as chips or baked whole, as a common side dish. 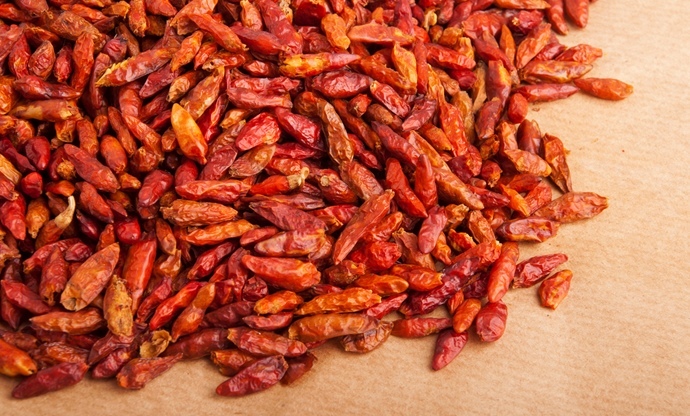 The most common condiment is akabanga, a very hot chilli oil sold in small bottles that’s added to dishes before eating. Near Lake Kivu, fresh fish are often barbecued whole or on skewers, and sombe (a dish of stewed cassava leaves) is a common sight too. Beans are the most important staple in Burundi, a largely vegetarian nation where cows are treated as sacred animals and most farmers choose to grow crops rather than rear animals. Plantain, sweet potato and maize is integral to the local diet, but kidney beans are eaten almost every day. Freshwater fish from Lake Tanganyika are caught and eaten by wealthier residents of Burundi, and sometimes goat or chicken is barbecued or stewed, but only on rare occasions. Onions, tomatoes and chillies are used to flavour dishes, with cumin and turmeric the most common spices. Piri piri chilli sauce is also served with almost every meal.